Virtual Teleportals: How soon could your company lead a Digital Earth? 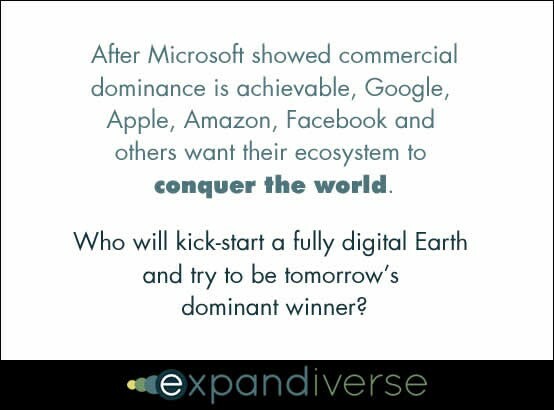 How could your company kick-start a Digital Earth and seize its competitive advantages sooner? Companies could start evolving quickly by adding Virtual Teleportals and infrastructure services. A transition is already happening as we use more screens with online components. We know we are turning digital. Continuous connections can grow to include everything. 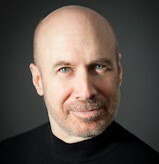 The world becomes “you-centered” instead of device-centered or product-centered. A Virtual Teleportal could be more than competitive advantage. It might trigger a disruption. Interviewer: Companies may be interested in this but there is gap from where they are today. It is almost as though someone invented a new car that has great tires and everything but is made for asphalt roads but all we have is dirt roads and gravel and we know that we are going to build a highway system at some point. How does a company begin to see how they can make that transition from an investment standpoint and also a product standpoint? Dan Abelow: The transition is already happening. As we use more and more screens, as we use our devices for more and more apps, we know that we are turning to this emerging digital reality more. Companies know that as well. Therefore you see all kinds of hybrid devices; it’s not just phones or tablets, it’s phablets. The same thing is happening to laptops. Are we going to need laptops or is the tablet going to transition and emerge and takeover that space? So there is a convergence. Operating systems are beginning to move in those directions and companies see this coming, in the sense that they’re already being pushed by the market, by what users want. There is a good example in television. Until a certain point in the evolution of devices, every device had to have a TV tuner. But now, people are using laptops to watch TV shows and laptops have no tuners in them, but they are watching enormous amount of TV on laptops and tablets. Those do not have tuners. The point is that the processing and the storage have become dissociated from the device. So moving into an Expandiverse, you need two things. You need a back-end that does what an Expandiverse does and you need a front-end client. 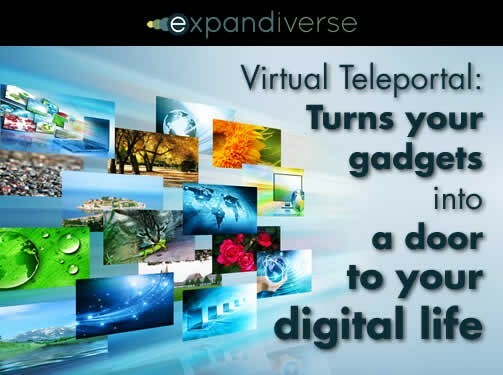 Part of the Expandiverse is a Virtual Teleportal that will run on various kinds of existing devices. Once you have that, everybody with existing devices, if it can support a Virtual Teleportal just like a laptop can support the ability to run a TV show without a tuner, you now have the ability to bring Teleportaling and the Expandiverse to everybody — from the back-end. Then, as people move in to it, as the features and functions become part of what they do, you have the ability to then sell more devices, or build teleportal features and functions as features into existing devices and make that transition forward. Speaking hypothetically, some companies could start evolving quickly by starting to add Virtual Teleportal features. Different features can be added gradually, and aren’t all needed right away. One example feature is continuous connections, which can grow to include your people, services, tools, resources and places. Another is continuous switching between the Virtual Teleportals on your different devices, so your continuous connections stay with you as you use different devices throughout your day. Another can be separate Shared Planetary Life Spaces for your different sets of connections. There are also other Expandiverse features, like managing your privacy and boundaries. With its Virtual Teleportal, one company can start delivering your digital world on all your devices, everywhere you go. You become “you centered,” more immediate and powerful — and they capture your revenues and attention as you live in your continuous digital world. Speaking competitively, the use of Virtual Teleportal features could be more than a competitive advantage. It might trigger a huge disruption. In an Expandiverse, the tech industry loses some industry boundaries. What happens when tech’s strongest companies use Expandiverse Teleportals — both virtual and physical devices — to blend communications, computing, the Internet, television, entertainment and more — then develop compelling designs and lifestyles for continuously connected digital living? It’s head-to-head competition. The rise of tomorrow’s digital world may be the first signal that it’s the beginning of the end for some of today’s toughest competitors. Any one company might disrupt many others in these industries. From the devices industry: Apple, Samsung, etc. From cloud services: Amazon, Microsoft, Google, etc. From online communications: Skype, Slack, Google, etc. From telecommunications: AT&T, Verizon, etc. From social media: Facebook, LinkedIn, etc. From videoconferencing: Cisco, Microsoft, etc. From the hardware industry: Apple, HP, Dell, Lenovo, Samsung, Microsoft, etc. Speaking seriously, how do we get from today to an advanced digital world? The Virtual Teleportal may be just the beginning. 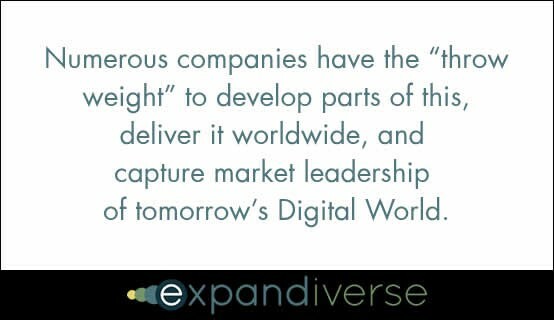 Expandiverse Technology might give leading companies the power to redefine industries and the world. There’s a race for the future by many companies and startups. It will be interesting to see when and how these new competitive advantages are used. And how far they’re taken. Where do you think we’ll be in a year or two? In five? In ten years? How much will today’s world change, and when will we get there? Next Chapter: When will new technology make today’s greatness normal? As Inequality and our Crisis of Success deepen, will we Journey to Greatness and become powerful and capable people?